If you're new to the real estate business or new to the area, get help. A CMA isn't just comparative math. Thorough knowledge of the dynamics of property sales in the specific area is required to make judgments based on the data presented. "Real estate is local" is a well-known quote because it is true, and you must learn all about your local market. In other words, you need to know something about your market and why homes in one area sell differently and for higher or lower prices than comparable homes in another area. Just comparing numbers without knowing about the neighborhoods and properties can be a disaster. The single most important activity in a CMA is the choice of comparable properties. Statistically, sales far above or far below the bulk of the group are suspect. There likely are valid reasons for the divergence. If you have enough recent comps, throw out the way too high and way too low price sales. Make sure you can justify comps not used. If you decide a comparable is not appropriate, have a good reason. If you're asked later by your client why you didn't use a certain home, you'll want to be able to answer truthfully and justify your actions. 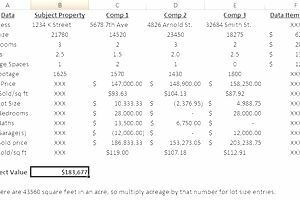 Pull comparable properties from the subject property's area or as close as possible. If it's impossible to find enough comps in the same neighborhood, then using some from a similar neighborhood in another part of town may be necessary. Use sold comparables that are not too old. Stay in as current a time frame as possible. In fast markets, this is easy, but not so much when sales are slow. If you have to go back more than two or three months, you probably will need to make some subjective adjustments for the long period. It's not easy, as there really is no rule for how to do it accurately. Add or subtract value for the difference in the lot or acreage size. Do the same for feature differences, such as bedrooms, baths, garage, etc. Look at financing differences that could have influenced sale price. Seller financing can at times result in a higher price paid for a property that is not related to its true value. Remember that these need to be "arm's length" transactions. There should be no special situations, family sales, distress sales, etc. A full and detailed report to your listing prospect/client cannot be complete without a similar market analysis of the properties listed and competing with their home at the time. Your list price recommendation can be modified up or down depending on how many homes are listed in the area at the time and their list prices. Knowing that some of the highest sold comps came from periods with very low inventory could cause you to amend your list price estimate downward a bit if the current market has a significantly higher inventory. Going the other direction, if there are fewer homes available, you may be able to adjust your asking price upward. This is not a promotion for "pretty". There are software solutions for almost any MLS system that produce very polished looking reports for comparative market analysis. The value is in the data and your interpretation of it. Don't let the glitz of the "presentation" take on a higher importance than the selection and interpretation of the data. What Is a Real Estate Franchise?